Punjab Congress has always toed the line of Delhi be it the dividing Punjabis on communal lines, denying Punjabi language its due, robbing Punjab of its river waters, Operation Blue Star, massacre of Punjab youth in the name of combating terrorism, shifting of Punjab industry to neighbouring states, destroying Punjab's school education, large scale migration and settlement of Bhaiyyas into Punjab, encouraging birth control in Punjab and the most dangerous plan of wiping Punjab youth through drugs. It is suspected RSS and other Central agencies are closely monitoring supply and drug traffic in Punjab. They are using dishonest Punjabi leaders and officer in this criminal activity. Punjab police has virtually become helpless and in some cases helping this anti-humanity crime. All these years we all have seen how petty coolies and careers of drugs being nabbed by police. 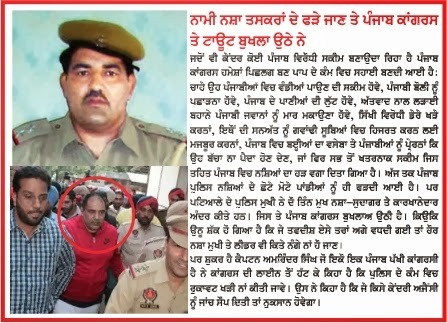 It is for the first time that a kingpin of drug trade namely Jagdish Bhola (a DSP in Punjab Police) has been caught after a prolonged tracking. Obviously the leaders involved will never like this to happen. They have raised a hue and cry to sabotage further investigation. It is learnt that they have provoked the drug lord Bhola to name Bikram Majithia. Bhola alleged he is not the drug dealer and he has been wrongly trapped into it. But the question arises how and why large amount of drugs caught from him? Why he didn't make a statement at the initial stage when he was running here and there to evade arrest. Obviously the Punjab Congress is again becoming a tool in the hands of vested hands to thwart investigation. Punjab Congress is demanding that the investigation be handed over to CBI a Central Agency whereas the Punjabis have ever been suspecting the Delhi agencies role in the Punjab drug trade. Here is a news that captain Amrinder Singh has suggested that progress in the investigation be not thwarted. Chandigarh, Jan. 10 (PTI) Former Chief Minister Amarinder Singh today strongly opposed the move to handover the ongoing investigations into the alleged drug racket to another agency from Punjab Police. Singh, a Permanent Invitee to the Congress Working Committee pointed out, the police led by Patiala SSP Hardial Singh Mann had done a commendable job by busting the racket and entrusting the case with some other agency would affect the investigations. He strongly opposed any such move to take away the investigation from the Punjab Police and give it to some other investigating agency lest it is allowed to be delayed, deviated and drifted from the right course it is going on. The former Chief Minister pointed out, the police led by Patiala SSP Hardial Singh Mann had done a commendable job by busting the racket. “We must not seek the CBI investigation for the heck of it particularly when the investigation is at a crucial stage”, he observed, while warning, “giving it to anyone else at this stage will mean playing into the hands of the criminals and vested interests”. Capt Amarinder also cautioned all the leaders and parties involved to exercise restraint lest they play into the hands of the vested interests whose aim might be delaying and diverting the investigation towards a different end. “We have to be careful against the trap laid out by the main accused to shift the focus of investigation apparently in a smart bid to save his own skin”, he warned. Probably, he added, the people who want the case to be handed over to the CBI at this stage, when Patiala police is nearing the conclusion into the investigation, only want to delay the matter to save their own skin as delaying the matter can only help the culprits. “We can’t allow our police to be demoralised that too after the outstanding job they did by exposing the racket and handover it to some other agencies”, he remarked. 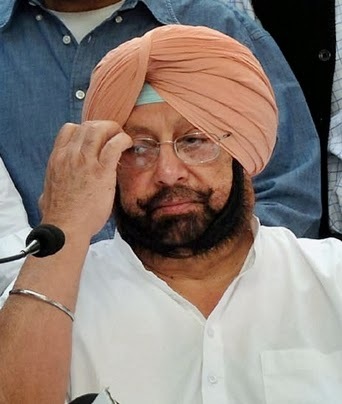 Capt Amarinder said, he as well as the people of Punjab had full faith in the integrity and commitment of the police investigating the matter under the leadership of Patiala SSP to take this investigation to the logical conclusion and punish all the culprits no matter how big and powerful they might be or how influential positions they might be holding. The senior Congress leader said, the Punjab Police must be given their due for busting the racket. He pointed out, after all other investigating agencies like the Central Bureau of Investigation or Narcotics Control Bureau could not bust the racket which was going on at such a large scale and it was Punjab Police which did it and arrested the kingpin. 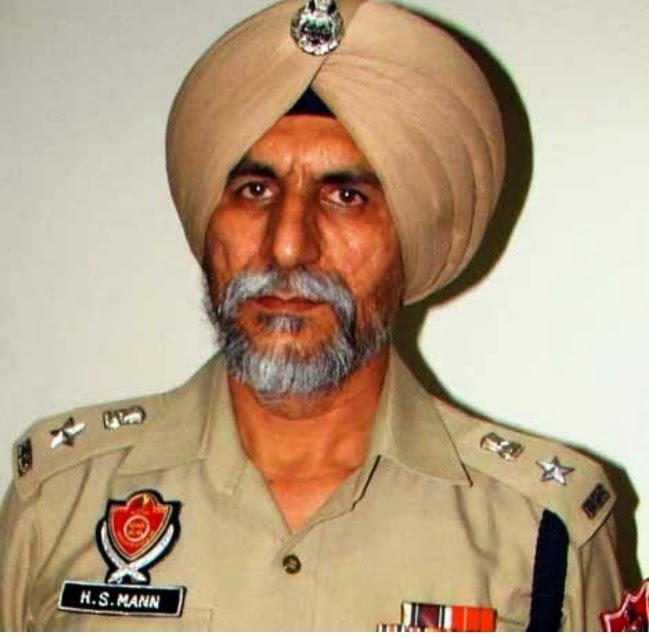 The senior superintendent of police, Patiala today refuted the allegations of alleged drug smuggler Jagdish Singh Bhola that state Minister Bikramjit singh Majithia was involved in drug trade. In a press conference SSP H S Mann said "He is adopting diverting tactics as we have cracked the case and he is wanted to distract the whole case". He also refuted the demand of CBI inquiry and added that he was confident about the hardwork being put in by his team and assured that he would take the case to a logical end. He said Many Central agencies, including Narcotics Control Bureau(NCB), Army intelligence, Central Intelligence Bureau (CIB) Border Security Force (BSF), Enforcement Directrorate (ED), Punjab police intelligence wing was jointly investigating the case along with Punjab police. Mr Mann said "Bhola has been trying to shift the focus of the investigations since day one and this is just another attempt to divert attention from the main culprits. We have collected sufficient information against all drug smugglers which are around 40 in number, including Bhola and many international smugglers, and we will ensure that all guilty are nailed. "My team is working very hard in this case and we have assured that the enquiry was totally transparent," he added.